What do you have in your pantry to help you in time of need? How can you build up your storage? http://storethisnotthat.com/build-basic-food-storage-10-week/ - do you eat out one time a week? Read this to see how you can use that $10 to build your storage. http://storethisnotthat.com/wp-content/uploads/2017/01/10-a-week-plan.pdf - this is doable and you don’t need to worry if you don’t live close, you can have it shipped. I mentioned to pick up something for storage each time you go into a store - believe me, you probably go into stores a lot. There are other wonderful things you can get in that store you go into... peanutbutter for example. How are you coming on your skills? I've talked about learning to make sourdough bread. If you are gluten free, but not celiac, this would help you with your bread as the sourdough breaks down the gluten… check into this as it would be helpful to try and see if you can do well on it. 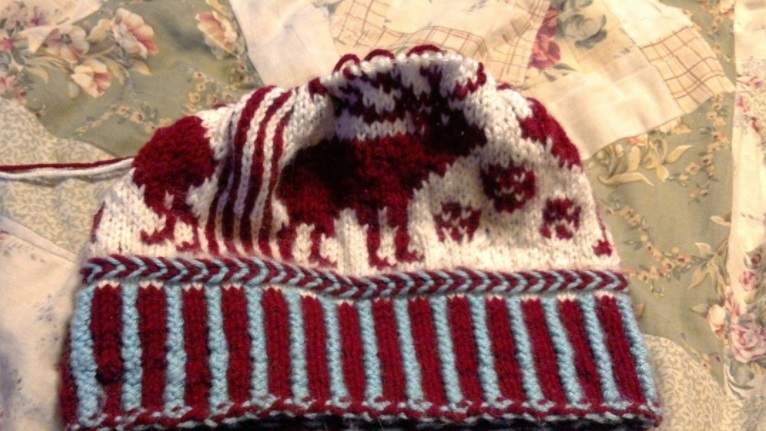 I wanted to do color work with my knitting which is another skill I am working on. Here is my progress on that front. Because of my double ear infection I needed a better way of seeing my pattern while weaving so that I would not get so dizzy. After thinking on it for hours I found that if I dropped a clothespin in an already existing hole (as I did not want to hurt my antique loom) I could open the clothespin just enough to slide my paper in after writing a type of shorthand these numbers represent the pedals in order I press them with my feet. 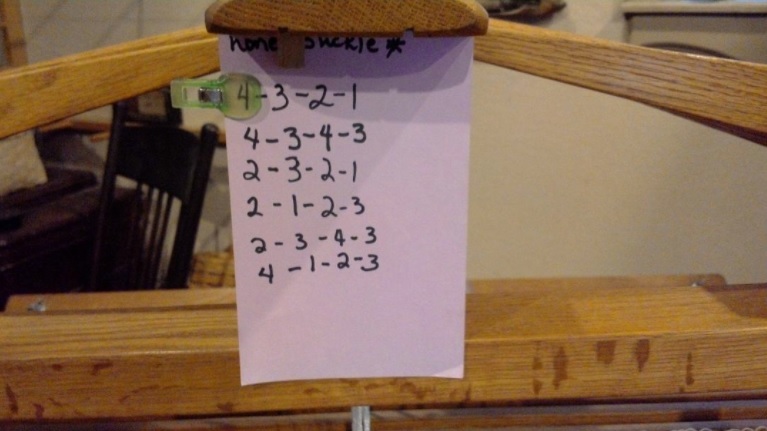 This is for the honeysuckle pattern. I put a clip on to move to where I am on the pattern. This was a blessing. Sometimes we have to think it through to come up with just the right thing. 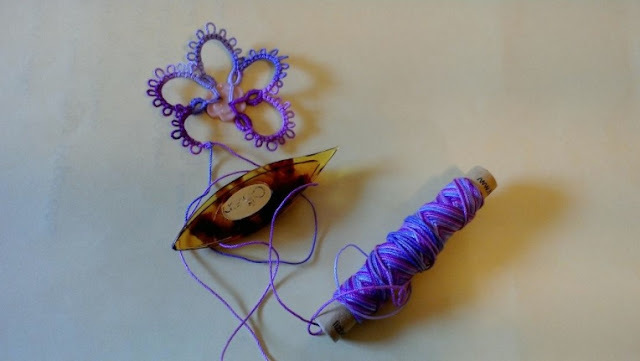 The other skill I am working on is pictured at the top of the page - tatting. I have been teaching myself with the use of the internet. That is a lot to be working on but I spread them out. I hope you are working on your skills? Please share them with us no matter how you might think it is not important because yes, it is! And we will all get inspired and we can all cheer each other on! http://storethisnotthat.com/?s=blender+wheat+pancakes - these are sooooo yummie. So work on your storage and work on your skill building and work on being more frugal. I don’t tat but I do know what it is and yours is very pretty. My pantry is pretty stocked on my food and household supplies. But I just read a kindle book called “ Powerless- the year the lights went out” and it’s convinced me to stay the course. Thank you i am learning. Yes stay he course i am surprised at how long we have made ours stretch of course i try to replace what we use when i can. One thing i have been noticing is how few cans of shortening are on the store shelves six cans here and one other store and you will see me talk next week on one other store that has none. Stay the course we would have a harder time if i had not. About shortening, it’s an ingredient we use but not as much as I used to. I rarely see shortening in current cooking articles, I think it’s trendier to use olive oil, coconut oil, butter.....maybe that’s why it’s harder to find in the stores. Yes that was my thought too i use two tbsp in my bread mix i hope they don't quit having it as oil goes rancid faster then shortening. Your tatting is very pretty. My mother in law knows how to do that and has made some pretty things. Your knitting is incredible. I'm glad you were able to make a system to keep up with your pattern. I just finished up a baby quilt and hope to work on some unfinished projects next. Thank you i am slow but i keep moving on. 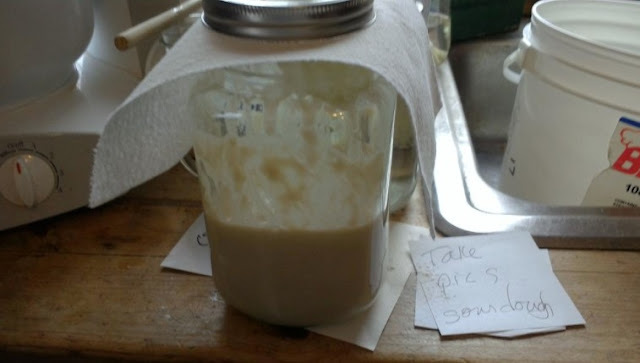 I was excited to see in the videos about sourdough starter that it can be dehydrated. 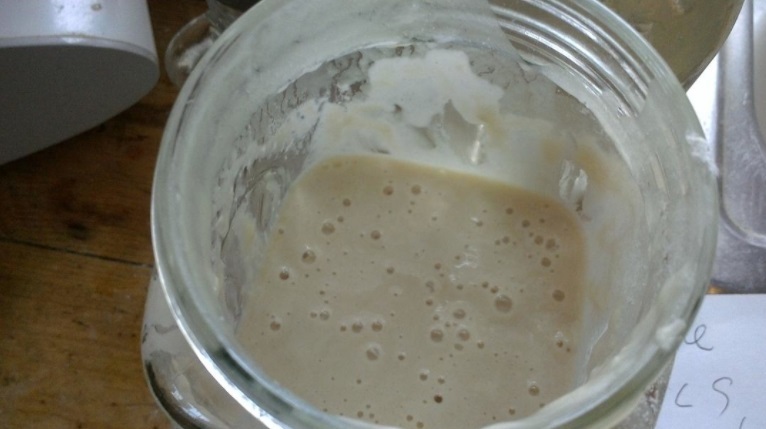 I used to make sourdough bread every week, but stopped for a while and my starter died. It would be nice to have some dehydrated for when I'm not using it as regularly. Your tatting looks great! That's on my bucket list of things to try eventually. Right now I'm learning to crochet edgings on towels and other things to make nice gifts. Yes she sells it and i tell you i followed her way and oh it is good right now not using as much so i keep in frig she calls putting to sleep and feeding it once a week. There are so many wonderful you tube videos on tatting just like having some one show you how to tat. Like you I have many projects going and in my free time (which is not much) I work on them. My grandmother tried to teach me to tat but failed. I struggled for years before internet but now there is so much one can watch to help us learn. I know never enough time it seems.